Wet. meadows, prairies, thickets, forest edges, stream banks, river banks, ditches. Disturbed sites. Full to partial sun. 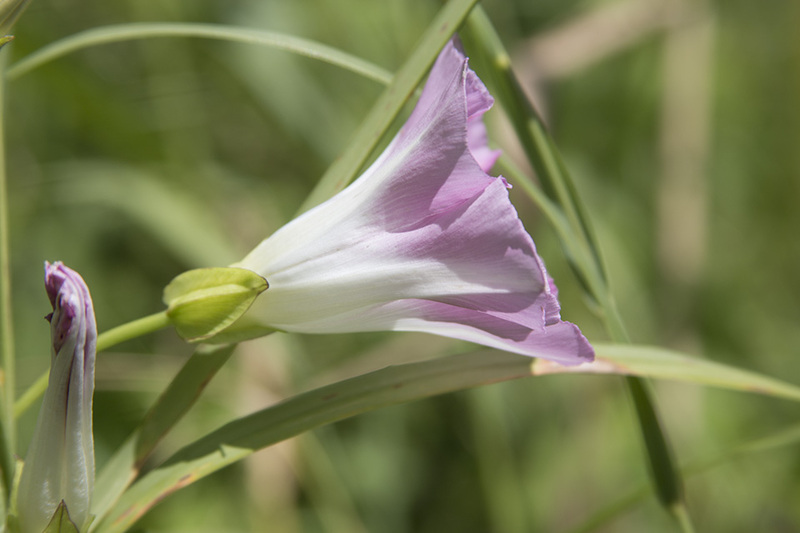 This is a perennial vine that rises on multiple stems from a deep, creeping rhizome and a deep, fibrous root system. The rhizome is branched and can be over 10′ long. 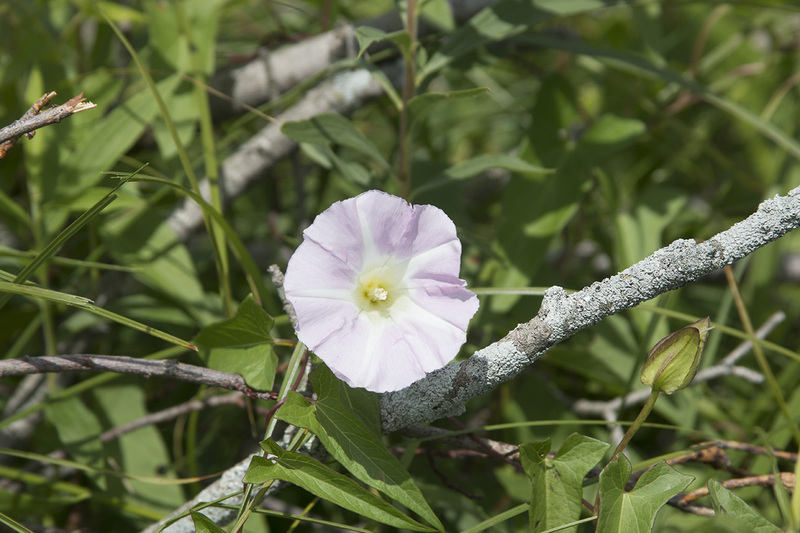 The stems are light green or red, hairless, freely branched, and either angled or round. They are usually awkwardly climbing over adjacent vegetation or structures (scrambling), occasionally prostrate on the ground but not rooting at the tip (trailing). 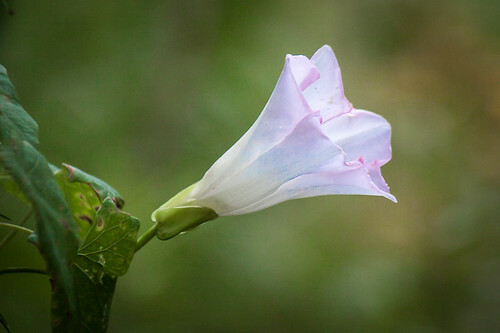 The stem grows in a spiral, at least toward the tip, curving around nearby plants (twining) in a counter-clockwise direction, allowing the stem to climb. They are usually 1½′ to 10′ long but can reach up to 13′ or more. The leaves are alternate, 2″ to 4″ long, and 2¾″ to 3″ wide. They are on leaf stalks that are always more than, usually much more than, half as long as the midvein of the attached leaf. The leaf blade is triangular in outline, arrow-shaped, pointed at the tip, and indented at the base. The basal lobes are trapezoidal and relatively spreading (directed outward). The sinus between the lobes is frequently broadly U-shaped. The upper and lower surfaces are hairless. The margins are untoothed. The inflorescence is a solitary flower rising from the leaf axils above the midpoint of the stem. The flowers are large and conspicuous. They are on 2″ to 6″ long flower stalks. 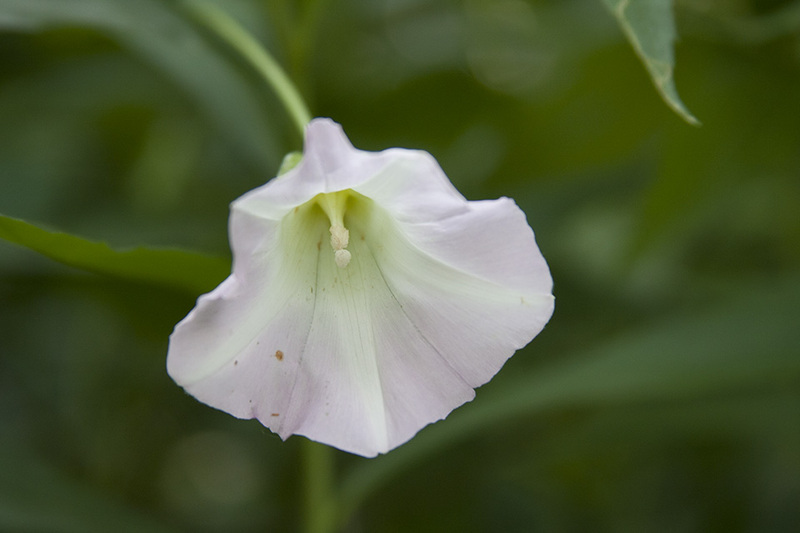 There are two conspicuous, leaf-like appendages (bracts) at the base of the flower. 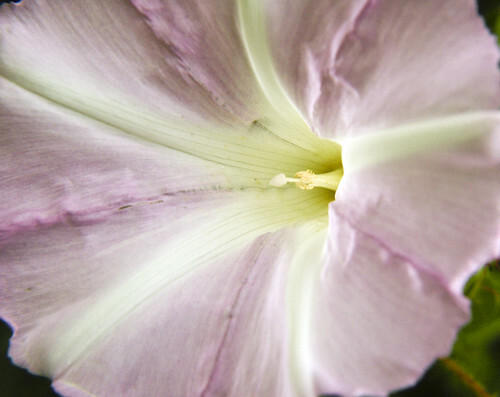 The bracts are ½″ to 1″ long and ⅜″ to 11⁄16″ wide. They overlap only near the base. 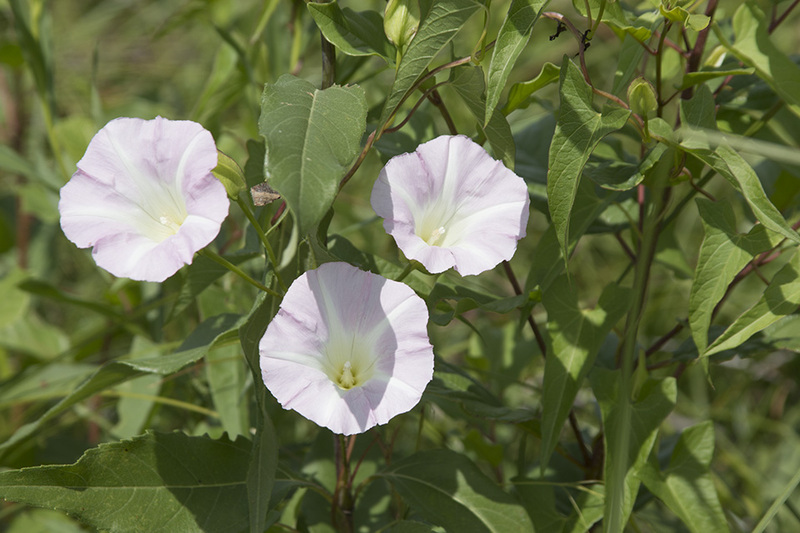 There are 5 petals, 5 sepals, and 5 stamens. The sepals are green, elliptic to narrowly egg-shaped, and 7 ⁄16″ to ⅝″ long. They are more or less hidden by the bracts that subtend the flower. 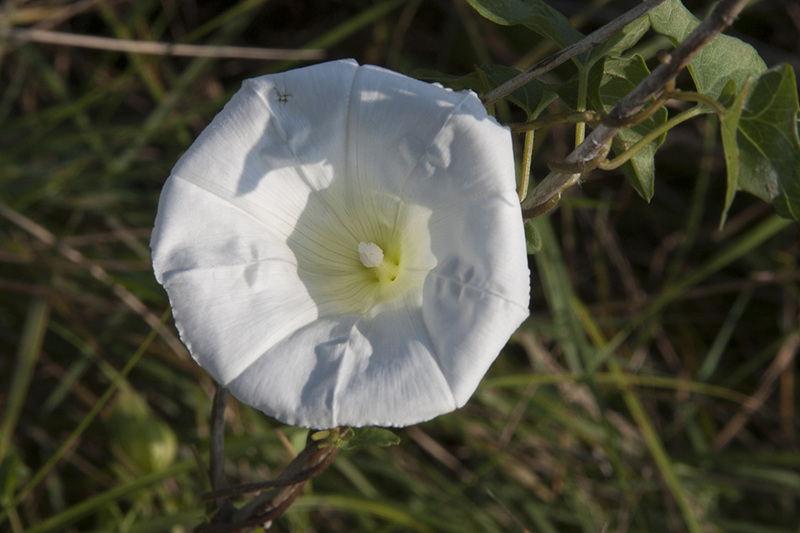 The petals (corolla) are fused at their base and for most of their length into a funnel-shaped tube and separated at the tip into five very shallow lobes. The corolla is usually white, rarely pink or pinkish tinged, and usually 1¾″ to 2½″ long and wide. The stamens are ⅞″ to 13 ⁄16″long and do not protrude from the corolla. The anthers are yellow. There is 1 style with 2 stigmas. The flowers open in the morning and close at night, but often remain open on moonlit nights. They are not fragrant. Insects may be attracted to the warmth inside the funnel, which may be 5° above the air temperature. The fruit is an egg-shaped, ⅜″ to ⅝″ long capsule with 2 to 4 seeds. 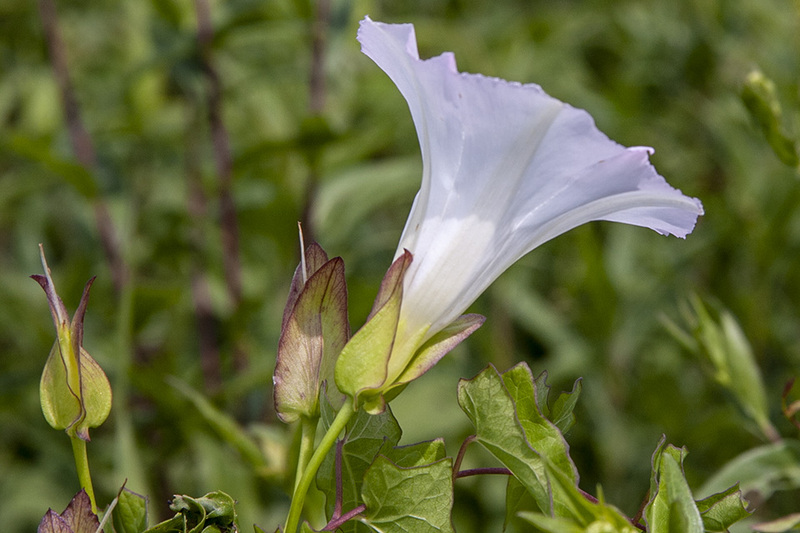 Low bindweed (Calystegia spithamaea) stem is erect, does not twine, and does not get over 20″ long. 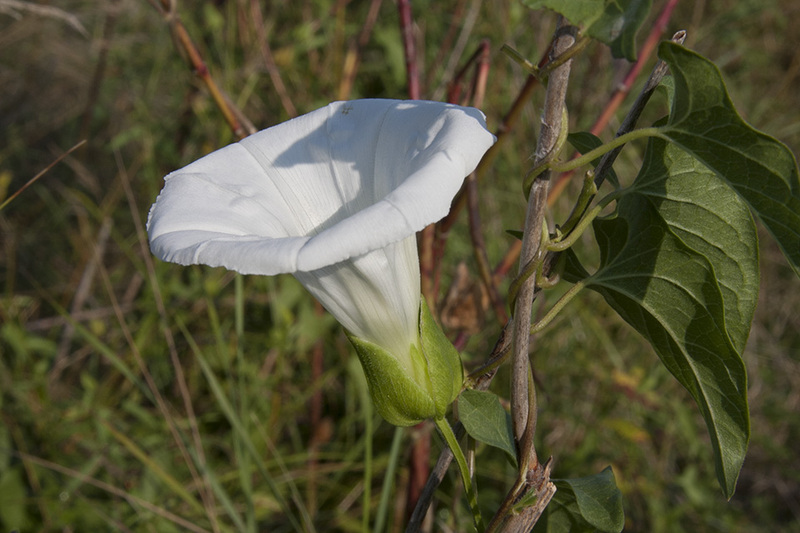 Field bindweed (Convolvulus arvensis) is a smaller plant. The leaves are smaller, 1″ to 2″ in length. The basal lobes of the leaf blade are pointed, not trapeziodal. The bracts are much smaller and are positioned on the stem well below the inflorescence. 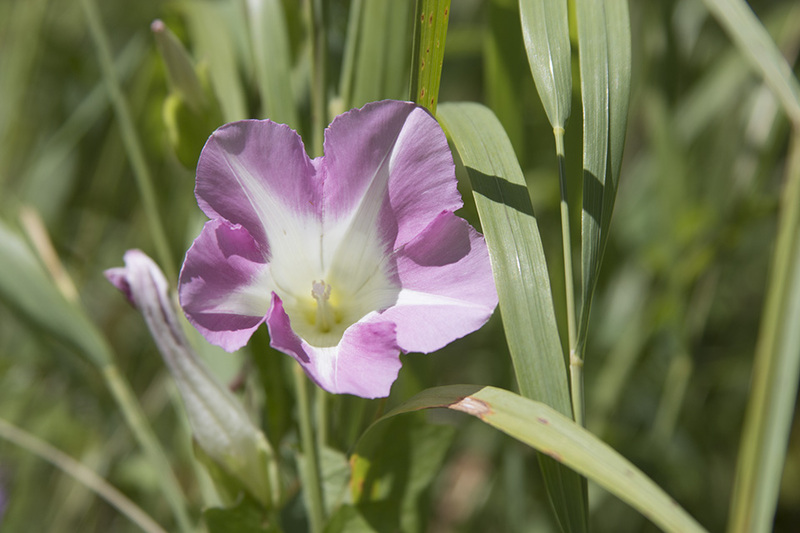 The flowers are smaller, 1″ or less long and wide. 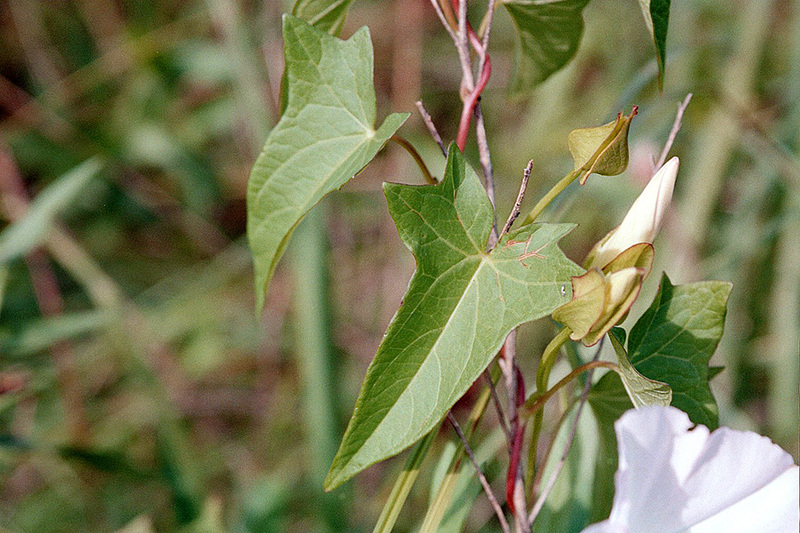 Black bindweed (Fallopia convolvulus) is a shorter vine, no more than 40″ in length. The stems and leaves do not have a milky latex. The leaf stalk has an ocrea at the base. 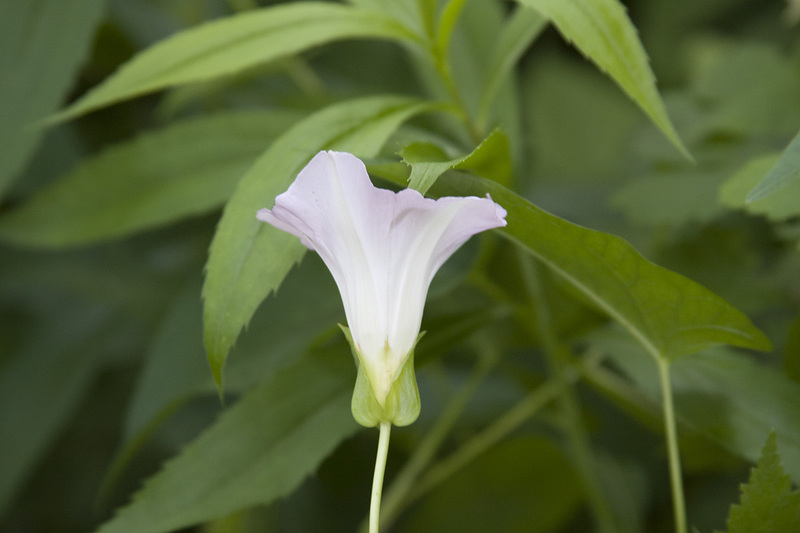 The flower is small, ⅛″ to 3 ⁄16″ long, and not showy. The fruit is an achene. Ivy-leaved morning-glory (Ipomoea hederacea) has 3-lobed leaves. The flower is blue to purple. 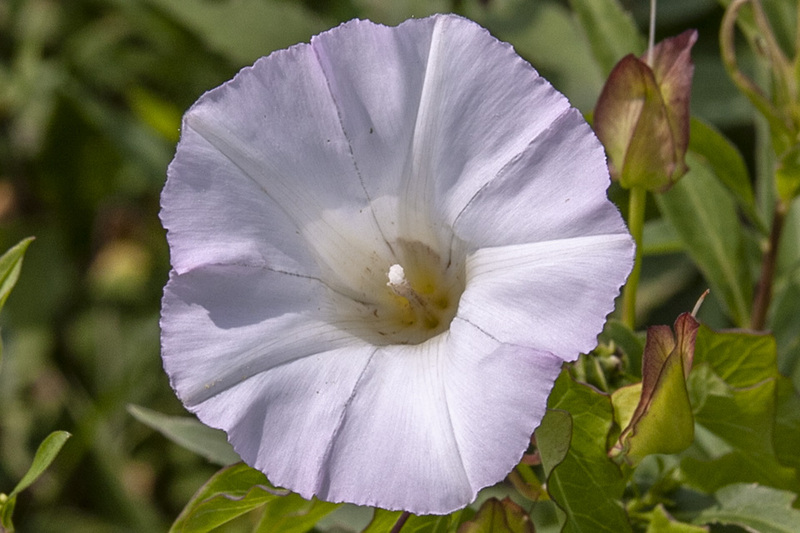 Common morning-glory (Ipomoea purpurea) has rounded, heart-shaped, not triangular, arrow-shaped, leaves. The basal lobes of the leaf blade are broadly rounded, not squared off or pointed. The flower is blue to purple. 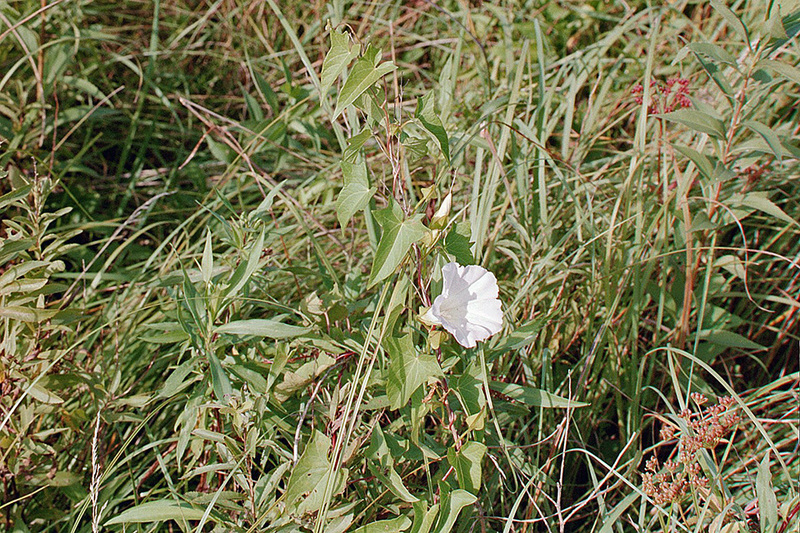 Appalachia false bindweed (Calystegia sepium ssp. 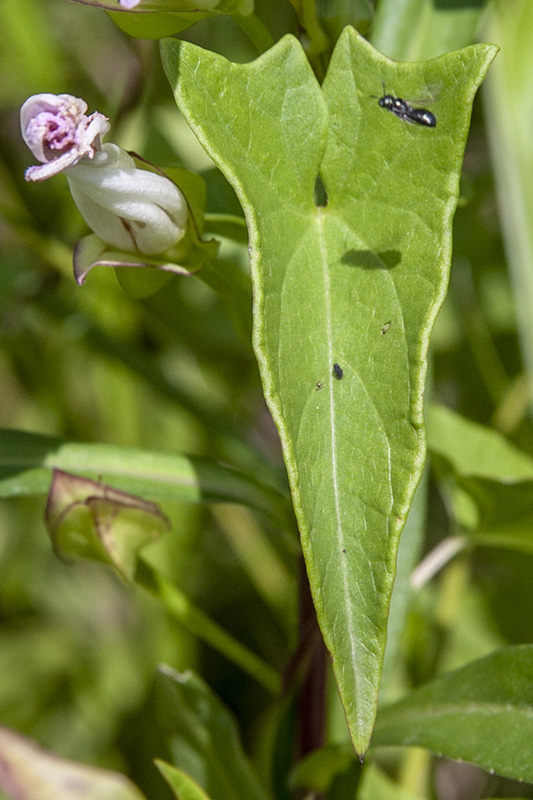 appalachiana) bracts are 9 ⁄16″ to 1″ wide. They usually overlap for most of their length, not just near the base. The corolla is usually pink. It is uncommon in Minnesota. 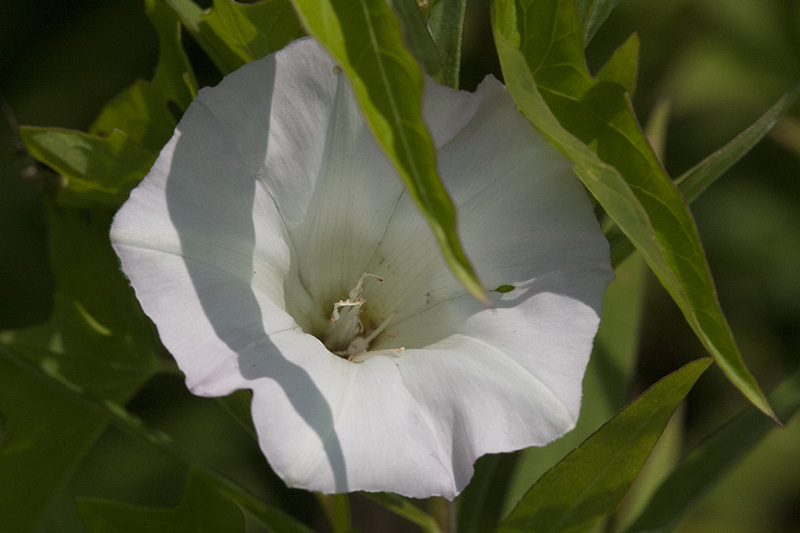 Hedge bindweed (Calystegia sepium ssp. angulata) bracts are ⅜″ to 11⁄16″ wide. They overlap just near the base. The corolla is usually white but is sometimes pink or pinkish tinged between white ribs. Climbing awkwardly over adjacent vegetation or structures.